Hi guys! Halloween is just around the corner, and I'm super excited. I may have mentioned (*once or twice*) that I LOVE Halloween. Do you have your costumes all ready to go? How about bags for trick or treating? I got you covered on that front!! I found these adorable shopping tote bags while I was grocery shopping a few weeks ago and I immediately knew they were destined to hold so much more than groceries!! Those black and white polka dots are just too stinkin' cute. In a matter of minutes you can create super-cute NO-SEW trick or treat bags for all your kiddos! I'm sharing the simple tutorial over at Lolly Jane so you can make your own. P.S. Did you know you can print on fabric with your little old ink jet printer at home?! It's EASY and opens up a whole new world of crafting fun for you. 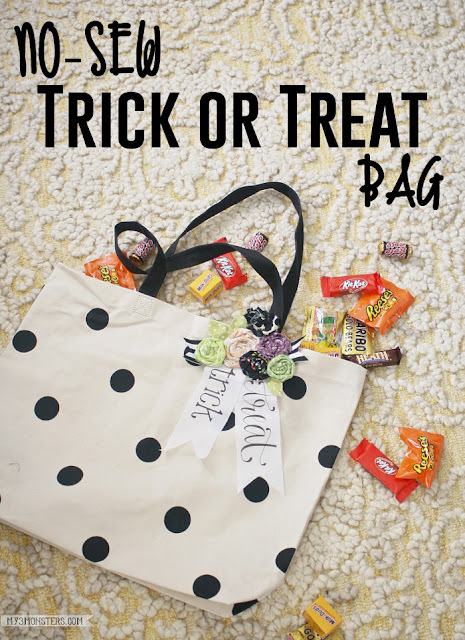 Get all the deets along with the trick or treat bag tutorial!